1. Tell us about yourself – when did you begin applying mehandi and how did you think of getting into this line. I’m a self taught mehandi artist and I love what I do! I have always been doodling and sketching for as long as I can remember, but playing around with a mehandi cone started in my early teens. I would just grab a mehandi cone at any family mehandi event and start applying mehandi designs on others, and of course I was always intrigued by watching other mehandi artists apply it. I could watch them for hours and hours. My passion lies in creating artistic pieces just right for my brides. I’ve recently begun sketching out custom designs for each bride. This keeps my creative juices flowing. 2. 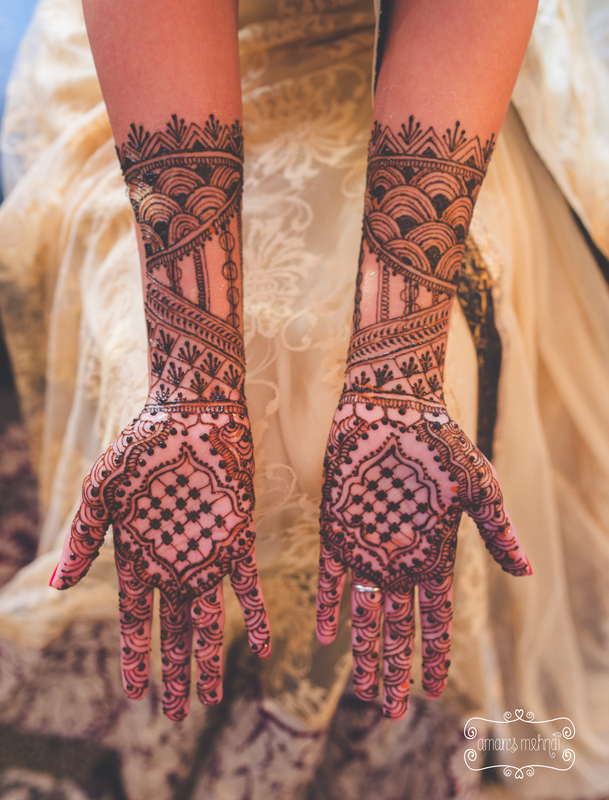 What are your top favorite mehandi designs? If I had to pick one personal favorite it would be my Great Gatsby inspired mehandi design, which I just did a few weeks ago. It was so much fun to design and a pleasure to work with this bride who had requested Great Gatsby patterns to be incorporated into her mehandi design. I absolutely loved the end result! Overall, you’ll notice I love spacing and working with both intricate and Arabic designs. Lately I’ve fallen in love with less traditional patterns (more aztec and tribal patterns). I try to incorporate these wherever I can. The possibilities are endless when it comes to mehndi, and that’s what makes me truly enjoy what I do. 3. What has been the most memorable experience you have had while doing mehandi designs – something that has stayed close to your heart and is remembered very fondly? I can’t really pick one memorable moment. I just LOVE working with brides – just being there and sharing an intimate and relaxing experience right before their big day is so special. And the fact that they have chosen you to apply mehandi, which will stay with them for weeks! That means a lot. I meet the most amazing people that I get to share and learn from. Whoever thought mehandi would be such a bonding experience 🙂 I’ve created so many lasting memories and friendships that will always stay close to my heart. 4. What are your most important tips to take care of the mehandi after applied? Number one is heat! It’s always simple to get a dark stain when you’re in a warm climate, however for us in Canada that’s not always the case so we have to create that environment. Making sure you’re body temperature is warm is very important in achieving a beautiful dark stain. I basically tell my brides to live by the heater or stove! Also, I recommend keeping the paste on overnight, and then scraping it off the next morning but still keeping your hands away from water for as long as possible (24 hours is ideal). 5. What is the best way to reach you? You may reach me at www.amansmehndi.com or on Facebook or email me. You could also follow me on Instagram and Twitter. Enjoy mehandi designs by Aman Sandher. (Published with permission of Aman’s Mehndi (henna). Please don’t use these images without permission from the original source).